How to fold and unfold my Mutsy i2? When folding up the frame and seat with the hood, the seat should be collapsed first before locking the push lock bar in the forward position so that the hood (for collapsing the frame) is located under the push lock bar. When folding up the frame and seat without the hood, the push lock bar should be locked in the forward position before folding up the seat and finally folding up the frame using the lock button. Press the folding safeguard inwards and tilt the upper frame until the lower support clicks into place and move the push-bar backwards until you hear a second click. 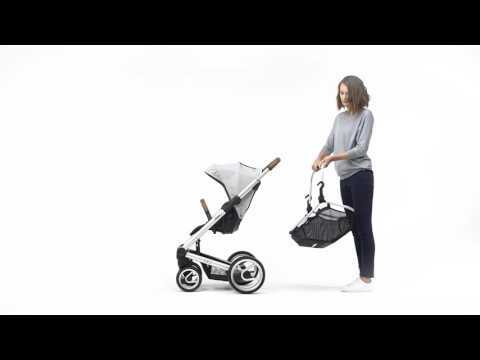 If you unfold the frame, with the pushchair seat fitted to the frame, you then have to manually raise the front brace afterwards. Stand behind the frame and put the frame on the brake. 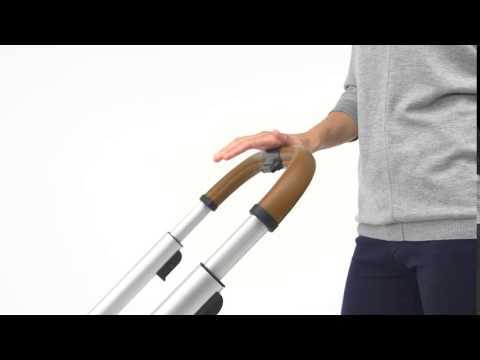 Pull the folding safeguard towards you and at the same time press the height adjustment button and move the push-bar downwards until the push-bar unlocks. Turn the push-bar forwards until it lies on the support. Pinch the frame unlocking buttons and fold the frame. 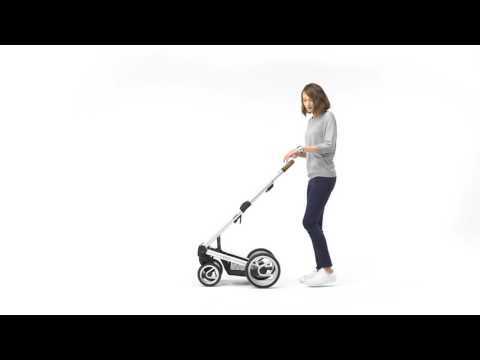 The integrated carry handle, which is located under the rear axle, has made lifting and carrying the folded pushchair more practical. Stand behind the frame and put the frame on the brake. Fold the hood back if it is folded out. Fold the seat unit in two by tilting the back support forwards. Pull the folding safeguard towards you and, at the same time, press the height adjustment button and move the push-bar downwards until it unlocks. Turn the push-bar forwards until it lies on the support. NB! The frame cannot be folded with the seat facing backwards! After unfolding the seat, always push the bumper bar to its upright position before placing a child in the seat. Make sure that no child is near the bumper bar when moving it. The demo video shows that it is possible to unfold the lower and upper frame in one move; nevertheless Mutsy recommends that the method shown above is followed. Adjusting the seat:: Pull the button at the back of the seat upwards and hold it upwards. The back support has 4 positions. Place the back support in the desired position and release the button to lock the position. Adjusting the foot rest: Lift the leg support to place it upwards. Push the buttons on both sides of the leg support and push the leg support downwards to lower it. The i2 basket at the base of the frame can carry a weight of 11 Lbs. Take the seat off the frame and remove the cover. Undo the belt on the central leg-piece. This is located under the seat section. Push the belt through the buckle slightly and use the loose piece of belt to pull the buckle out of its lock. Take the buckle and belt upwards through the hole in the fabric and seat. Then loosen the hip belts. These are fixed behind the bag on the back of the backrest. Push both belts through the buckle slightly and use the loose piece of belt to pull the buckle out of its lock. Take the buckle and belt through the hole in the fabric and seat. Open the panel behind the backrest in order to undo the shoulder belts. Push both belts through the buckle slightly and use the loose piece of belt to pull the buckle out of its lock. Take the buckle and belt through the hole in the fabric and seat. Click the panel back into place. two press-studs under the seat, one press-stud under the upholstery on the leg supports, two press-studs on both sides of the seat section, two press-studs on both sides of the back rest. Gently pull the upper edge of the fabric out of the groove. Start on one side and pull small sections at a time. Attach the upper edge of the upholstery in the groove above the backrest. Begin on one side; fold back the hard edge and slide this into the groove on the seat. Gently push the upper edge bit by bit into the groove at the top of the backrest. two press-studs on both sides of the seat, one press-stud under the upholstery on the leg supports (take the belt through the loop to secure), two press-studs on both sides of the backrest, two press-studs on the front of the seat. Open the panel behind the backrest in order to secure the shoulder belts. Push the buckles through the openings in the fabric and seat and click both buckles into the locks. Secure the hip belts. Push the buckles through the openings in the fabric and seat and click both buckles into the locks. What would be the ideal air pressure on the tyres of the i2 air? And how do I inflate them? To adjust the length of the shoulder straps, loosen the shoulder protectors from the belt by undoing the velcro. This will reveal the belt buckles. Adjust the length by sliding the buckles along both shoulder straps until your child is comfortably secure. After adjusting, press down the velcro on both sides to relock the shoulder protectors in place. The back support contains three positions for the shoulder belts. To adjust the position, open the panel behind the back support. Loosen the shoulder belts by moving the attachment rings through the openings. Move the attachment rings through the desired openings so that the shoulder belts are positioned properly and click the panel back. Install the IGO rear wheels : Slide the axle of the rear wheel in the rear wheel casing until you hear a click. Pull the wheel to check that it has been attached firmly. Install the IGO front wheels: Slide the axle of the front wheel upwards in the front wheel casing until you hear a click. Pull the wheel to check that it has been attached firmly. Remove the IGO front wheels: Push the button on the front side of the front wheel and pull the wheel from the front wheel casing. Turn the ring above the front wheel inwards on both sides in order to block the swivel setting. 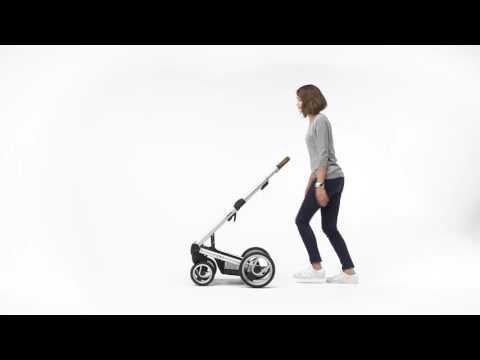 The swivelling wheels will automatically be locked when the wheels are placed in the rear direction. Turn the ring above the front wheel on both sides outwards to unlock the swivelling wheels. How do I assemble and disassemble the i2 basket? Undo the three press studs that secure the basket to the rear axle. The basket is secured to the chassis at two points on both sides. Push the attachment part of the basket out of the chassis from underneath. The basket is secured on both sides by a press stud on the elastic that runs around the H-wire. Undo the press stud (which is located on the side of the basket). At the front, the basket is secured at two points on the chassis. Push the attachment part of the basket out of the chassis from underneath. At the front, the basket is secured at two points on the chassis. Push the attachment part of the basket into the attachment part of the chassis from above. The basket is secured on both sides by a press stud on the elastic that runs around the H-wire. Pull the elastic through the H-wire before securing the press stud. The basket is secured to the chassis at two points on both sides. Push the attachment part of the basket into the attachment part of the chassis from above. Secure the three press studs that secure the basket to the rear axle. Undo the cover and bumper bar in order to create more space. There is a black polyester section with a round recess at the end of the footmuff. This must be turned over towards the back of the footmuff. Place the footmuff cover over the seat back support. Make sure that the adjustment button for the back support ends up in the round recess. Re-attach the shoulder belt to the hip belt. Replace the cover and the bumper bar onto the seat. Which car seats are compatible with the Mutsy i2? Placing the adapters: The adapter marked with ‘R’ is placed on the right side of the frame, the adapter marked ‘L’ is placed on the left side. Slide the adapters in the attachment parts and press solidly until you hear a click. Check the adapters by trying to remove them from the frame. Removing the adapters: Slide the unlocking button on the frame attachment points upwards until you hear a click. The adapter can now be taken off the frame.